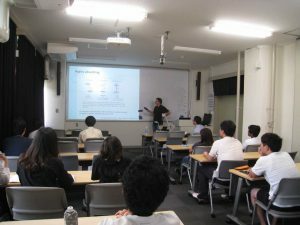 The 6th crystal science seminar was held on July 31, 2017. Prof. Patrick M. Woodward made a lecture entitled “Solid State Chemistry Investigations of Halide Perovskites and Double Perovskites.” The abstract of his lecture is as follows. The AMX3 (A = Cs, Rb, CH3NH3; M = Pb, Sn, Ge; X = I, Br, Cl) halide perovskites are a versatile and promising class of materials. Their electrical and optical properties are comparable to conventional compound semiconductors, which makes them suitable for many applications, including solution processed solar cells. Unlike conventional semiconductors the electronic structure, and optoelectronic properties, of halide perovskites can be tuned through distortions of the crystal structure. In the first part of my talk I will discuss our studies of Cs1−xRbxPbBr3 and Cs1−xRbxPbCl3 solid solutions. In the second part of my talk I will discuss our efforts to synthesize and characterize new halide double perovskites, Cs2BB′X6 (B = Ag, Na; B′ = Bi, Sb, In; X = Cl, Br), with tunable band gaps, a strategy we are pursuing toward the ultimate goals of removing lead and improving moisture tolerance of these materials.